Asylum Seekers support in Brisbane. Romero Centre. People seeking asylum face complicated challenges and uncertain futures. Our individualised case management service enables people seeking asylum to access the right mix of support and expertise. We provide and connect asylum seekers living in Brisbane with practical support (like food and shelter), legal connections, English classes, medical care, trauma counselling, community events and more. We share their journey and help make their life easier. Asylum seekers in Brisbane are struggling to survive. Can you imagine life without access to food and shelter? Asylum seekers are living in Brisbane with limited or no access to income. Without money, meeting the basic needs of living becomes impossible. We provide health and hygiene packages, food essentials, support with accommodation and clothing. There’s a growing need for practical supplies to suit children, families and individuals seeking asylum in Brisbane. You can help too by making a donation today. Did you know that simple errors caused by confusion can cause applications to be delayed or rejected? The conditions around temporary visas (and the forms that need to be completed) are complicated. Our qualified team provides support and access to lawyers and asylum seeker process specialists. Legal and process expertise is an expensive but vital service that helps make it easier for children, families and individuals seeking safety and protection from harm. Overcoming the English language barrier is a major challenge faced by asylum seekers. We provide free English classes, training opportunities and connect children and parents with support for families. These classes are provided at no cost and are a great chance for people to learn English and also connect with the community. We also provide access to interpreter services for meetings, legal appointments and to assist with understanding legal and government correspondence. The Romero Centre team also arranges for people seeking asylum to access training to boost self-confidence and provide real connection with the community. Asylum seekers often are isolated and without connection or support. Our activities for children, families and individuals bring the community together. They are a great opportunity for people to connect, encourage and share humanity across cultures. These regular events and activities provide people seeking asylum with opportunities to learn, laugh and connect with the Brisbane community. We also have strong connections with other community support networks, government agencies and departments. This includes access to qualified emotional support counselling – often needed by asylum seekers for recovery from experienced trauma. Esther fled from the danger and oppression of Iran. Arriving in Brisbane, she struggled to find basic food and shelter. Her smile shows how much her life has changed. The Romero Centre was established in 2000 in response to the needs of people arriving in Australia seeking safety and human rights. In December 2003, the Romero Centre came under the care of The Sisters of Mercy. 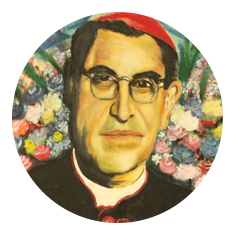 The Romero Centre is named after Archbishop Oscar Romero from El Salvador, a passionate human rights campaigner. His legacy of hope and courage continues to inspires all that we do. With the community’s support, we will continue to share the journey of people seeking asylum. Providing genuine welcome and the right support for those who have fled danger and are now struggling to survive in Brisbane.